There are four primary types of charts used by investors and traders depending on the type of information they’re seeking and their desired goals. These chart types include line charts, bar charts, candlestick charts, and point and figure charts. In the following sections, we will focus on the S&P 500 over the same period to illustrate the differences between the charts when the underlying data set is the same. Line charts are the most basic type of chart because it represents only the closing prices over a set period. The line is formed by connecting the closing prices for each period over the timeframe. While this type of chart doesn’t provide much insight into intraday price movements, many investors consider the closing price to be more important than the open, high, or low price within a given period. These charts also make it easier to spot trends since there’s less ‘noise’ happening compared to other chart types. Bar charts expand upon the line chart by adding the open, high, low, and close – or the daily price range, in other words – to the mix. The chart is made up of a series of vertical lines that represent the price range for a given period with a horizontal dash on each side that represents the open and closing prices. The opening price is the horizontal dash on the left side of the horizontal line and the closing price is located on the right side of the line. If the opening price is lower than the closing price, the line is often shaded black to represent a rising period. The opposite is true for a falling period, which is represented by a red shade. Candlestick charts originated in Japan over 300 years ago, but have since become extremely popular among traders and investors. Like a bar chart, candlestick charts have a thin vertical line showing the price range for a given period that’s shaded different colors based on whether the stock ended higher or lower. The difference is a wider bar or rectangle that represents the difference between the opening and closing prices. Falling periods will typically have a red or black candlestick body, while rising periods will have a white or clear candlestick body. Days where the open and closing prices are the same will not have any wide body or rectangle at all. (To read more, see The Art of Candlestick Charting – Part 1, Part 2, Part 3, and Part 4). Point and figure charts are not very well known or used by the average investor, but they have a long history of use dating back to the first technical traders. The chart reflects price movements without time or volume concerns, which helps remove noise – or insignificant price movements – that can distort a trader’s view of the overall trend. These charts also try to eliminate the skewing effect that time has on chart analysis. 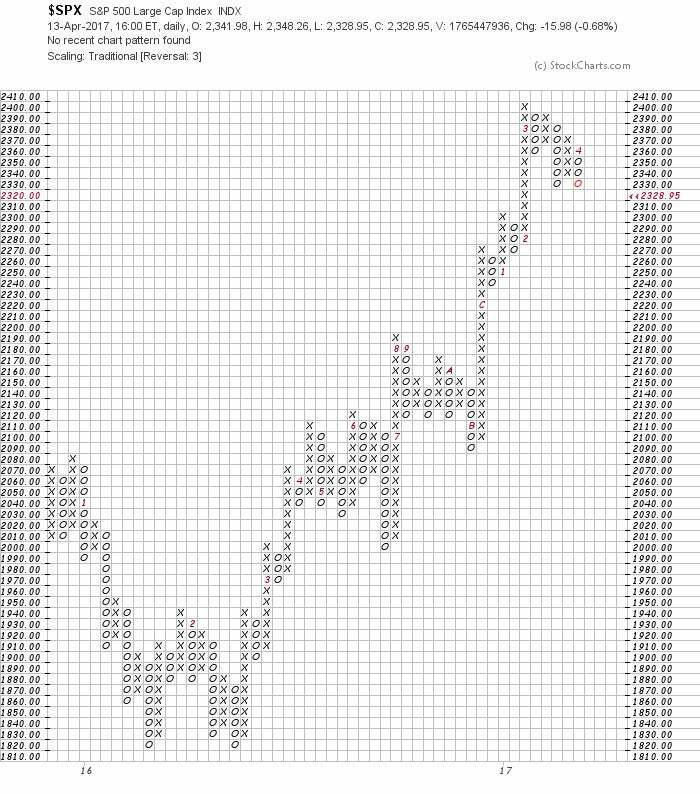 (For further reading, see Point and Figure Charting). Point and figure charts are characterized by a series of Xs and Os. The Xs represent upward price trends and the Os represent downward price trends. There are also numbers and letters in the chart that represent months and given investors a rough idea of dates. Each box on the chart represents the price scale, which adjusts depending on the price of the stock: The higher the stock’s price the more each box represents. On most charts, a box represents $1 or 1 point. Another key point to remember is that point and figure charts have reversal criteria that must be set by the technical analyst – although it’s usually set to three. The reversal criteria represents how much the price has to move away from the higher or low in the price to create a new trend, or in other words, how much the price has to move in order for a column of Xs to become a column of Os, or vice versa. When the price trend has moved from one trend to another, it shifts to the right, signaling a trend change. Charts are the most fundamental aspect of technical analysis. It’s important for traders to understand what’s being shown on a chart and the information it provides. Now that we have a clear idea of how charts are constructed, we can move on to the different types of chart patterns. Find out how to create well-designed charts that will enhance your market analysis. Discover why traders use swing charts, how these charts are constructed and how to start using them. Learn how to construct and read these price charts designed to highlight entry and exit points for longer-term positions. Learn about this basic technical indicator and how you can use it to chart the value of a security's price over a set period. Long-term weekly charts combined with the under followed Volume by Price indicator are pointing to higher commodity prices in 2017. Crowd psychology is the reason this technique works. Find out how to make it work for you.